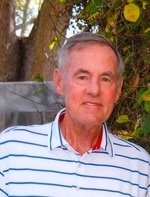 Lee Cooper Peters, 77, of Gardner, KS passed away March 5, 2017 at Olathe Med. Center. Visitation: 12:00 noon before the 1:30 pm Funeral on Friday, March 10, 2017 at Bruce Funeral Home, Gardner, KS (913) 856-7111. Cremation following service. Memorial contributions may be made to Susan G. Komen or the American Heart Assoc. Lee was born Oct. 27, 1939 in Coronado, CA to Maurice Albert and Gayle Estelle (Cooper) Peters. He moved frequently while growing up as his father was in the military. His father’s last military assignment was to the Olathe Naval Air Station where they settled in Gardner. He married his high school sweetheart, Mary Beth Davis on Oct. 11, 1958. Lee was a 1957 graduate of Gardner High School; received his BS in Business from Ottawa Univ. and earned an MBA from Webster Univ. His career path included stints at Cramer Products, Gardner Medical Center, Legal Administrator at the Law Office of Morris, Larson and King, ending his career retiring as Executive Director for Hunkeler Eye Center in 1997. Lee was a member of various civic and charitable organizations, including member/president of the Gardner Jaycees, served on the Gardner City Council and once served as President of the Gardner Chamber of Commerce. He was a member of First Baptist Church of Gardner. Lee had many hobbies that kept him constantly occupied. He was a highly skilled amateur woodworker who produced professional quality products in his wood shop. He was a gifted high school athlete and loved watching sports, specifically Jayhawk basketball, Royals baseball and the Golf Channel. He was an avid golfer and was still playing weekly at the time of his passing. He had a sweet swing that made others envious. His wife Mary was his greatest passion. They were inseparable, literally traveling the world and the United States. Lee and Mary’s marriage seemed to friends and loved ones as one long continuous first date. Their admiration, love and respect for one another was so obvious. He loved his children and they so loved him. He was their hero and role model. He was a doting grandfather to his grandchildren, their “Pappa”. He was a constant fixture at their school activities and sporting events. He always let people know about his grandkids. He was so generous with his time with his family and went out of his way to arrange family social outings and events to bring extended family together. He put together family golf parties, holiday cookouts and dinner clubs. He was a father-in-law that his son-in-law was so deeply thankful to have in his life. Those who were lucky enough to have had Lee cross paths in their lives knew him as the definition of a gentleman. He was kind, generous, and respectful of others. home; son, Mark Peters, Overland Park, KS; daughter, Kelly Peters-O’Brien and husband Jim, Overland Park, KS; brother, Lynn and wife Paula Peters, Overland Park, KS; sister, Kay and husband Claude Steed, Edgerton, KS and two grandchildren: Evan and Gillian O’Brien.